Our school’s campus us stunning and there are stairs everywhere. We’re surrounded by big green “mountains” on all sides and the air is the complete antithesis of Beijing air. Spenser and I went running around the track yesterday morning and I didn’t have to use my inhaler once. Perfect. There are also massive bats that fly around at night. Seriously. I feel like Batman whenever we walk around after dark. They swoop down and eat the mosquitoes and I giggle every time I see one (which is very “un-Batman” but I can’t help it). The downside of living in such a beautiful, quiet area is that we have to walk at least 5 minutes to get anywhere on campus and almost 10 minutes to get to our bus stop which, coincidentally, is the end of the line for most of the buses. Yantian has yet to be blessed with a metro system (again, mountains make it a bit difficult to just start digging around here) so if we want to go to any of the fun places in the other districts, we have to take a bus out of Yantian and catch the metro in Luhou. That trek alone takes a little over an hour. Luckily, all the buses are equipped with TVs and I’ve discovered I’m a huge fan of Chinese commercials. Let me remind you that my Chinese is terrible and I never have any idea what is going on, but the commercials are always ridiculous and absolutely hilarious. Ok, so for fun lately we’ve been sticking to three districts: Yantian (home base), Luhou (our neighbor), and Futian (super downtown Shenzhen). On one of our first nights here, we went to a beer garden in Luhou with a lot of other CTLC people and it was a blast. The beer was cheap, the crowd was lively, and we all had a great time. It was also the first real place where people asked to take pictures with me and it was hilarious. After they discovered that I was okay with it, I suddenly became super popular and made everyone take pictures with my camera too. Enjoy. I think they didn’t appreciate Spenser’s beard, so he stuck to the back. Us and our new good friend Curt. He’s from Philly and he likes jam bands. This sums up picture taking time at the beer garden. Shirtless dude, iPhones, and peace signs. A few nights after this, we went to a really popular party spot in Futian called Cocoa Park. There was some heavy clubbing going on and the beer was WAY too expensive ($4.50 for a tiny bottle of Tsingtao? I THINK NOT!). Ok, so when I put it that way it doesn’t sound too bad. In China money, $4.50 is 28 Yuan. To put this “expensive” beer into perspective, the huge bottles of Tsingtao we buy at the corner store down the street are 3 Yuan, which is .50 American cents each. So yeah, as soon as we got there (after an hour and a half of bus/metro time) we were already down to leave. I wasn’t having a particularly great time but Spenser was freaking out. It was the last place you’d ever expect Spenser to have fun (constant club music, expensive booze, drunken idiots everywhere trying to hit on anything that moved, etc.) so we’ve vowed to never, ever go to Cocoa Park again. After the Cocoa Park debacle, we decided we needed a beach day. 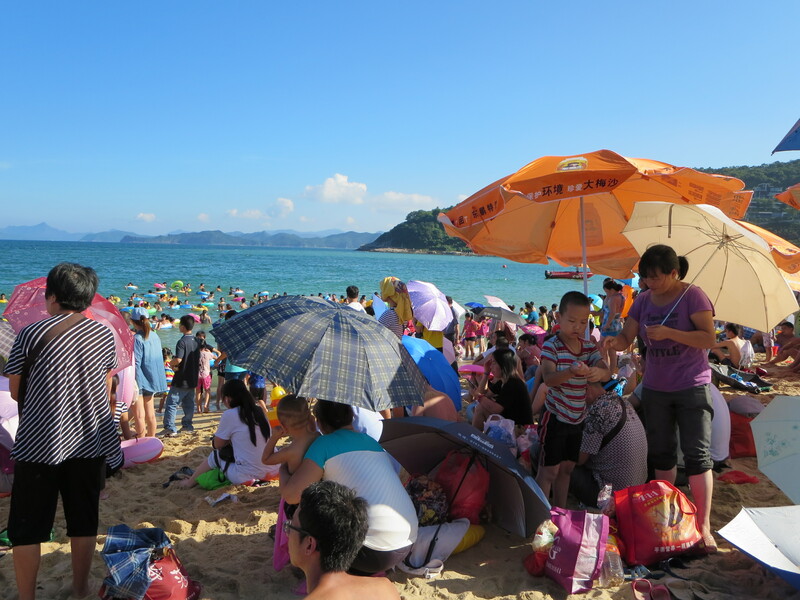 We took some CTLC friends from the metro to Dameisha Beach in Yantian, a 20 minute bus ride from our school. The beach was kind of weird to get to but it was beautiful…from afar. Dameisha translates to “Big Sand Beach” and this big sand beach is also free, so even though we went on a Monday, it was packed. OH MY GOD! PEOPLE EVERYWHERE! Once you were actually on the part of the beach it was recommended to swim at, the beach itself was actually filthy. There were no trash cans anywhere so everyone just tossed their stuff on the sand. You’d step on water bottles, plastic, chip bags, napkins, toilet paper, literally everything. Oh, and have I mentioned that there were naked little boys everywhere? I saw more than ten naked little boys swimming and definitely two just peeing on the beach. I know the number one rule of Chinese history is that there are a lot of Chinese people, but come on! I know you’re proud to have a son, but for God’s sake, cover up his wiener! Nobody wants to see that! Trash and tiny wieners aside, we still had fun. We eventually walked a ways to a more secluded but still kinda gross part of the beach and swam out a bit. The best part of that day though was after the beach. We found a tiny expat bar called The Office and they served 6 kuai PBR on tap. After drinking really crappy Tsingtao all the time, this was a welcomed surprise. Oh, and the bakery next door made hamburgers. Overall, it was a good day. Us and our friend Ariel. There were weird statues on the beach, so our friend Manu and I took some fun pics. 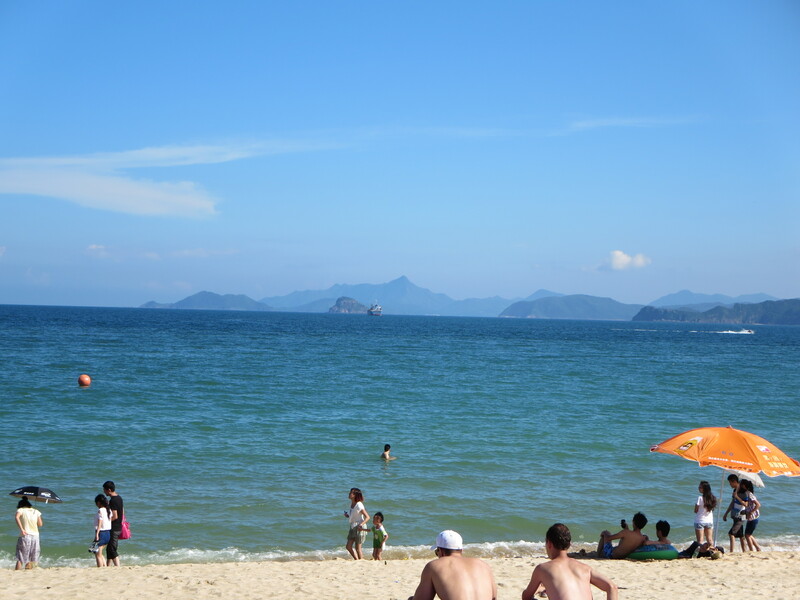 Swimming in the South China Sea. Yesterday was a most successful day because we bough a router! Yay for WiFi! We also spent most of the day meandering around Shatoujiao, the downtown portion of Yantian that has a ton of small shops and restaurants. Spenser bought a guitar, we ate some soup dumplings (which are, hands down, my favorite Chinese thing at the moment), and we chilled out in the neighborhood. All of the staircases in China have ramps for bikes and/or luggage. Quite smart. Tonight we’re exploring a new district, Nanshan! We’re going out with our coordinator/ dorm mate/ good buddy Kane to get pizza then we’re off to OCT East which is apparently the artsy fartsy part of Shenzhen, so I’m super excited about that. We’re going to go see a German “kraut-rock” band (I have no idea what that actually means) but we’ve been promised a good time, so we’re looking forward to it. Well, I hope you’ve enjoyed this long post about our current adventures! I’ll post again soon with more info about teaching (we start Monday! Ah!). Much love from the both of us! We miss you all! Mmmm soup dumpling…..yes….wish we had some! Y’all can keep the big beach.